The Green Hornet is a 2011 American superhero action adventure comedy film based on the character of the same name by George W. Trendle and Fran Striker that originated in a 1930s radio program and has appeared in movie serials, a television series, comic books and other media. Directed by Michel Gondry and written by Seth Rogen and Evan Goldberg, the film stars Rogen, Jay Chou, Christoph Waltz, Edward James Olmos, David Harbour, Tom Wilkinson and Cameron Diaz. The film was released to theaters in North America on January 14, 2011 by Columbia Pictures in RealD Cinema and IMAX 3D formats. Despite a negative reception from critics, the film earned $227.8 million on a $120 million budget. Britt Reid is the son of James Reid, the publisher of the Los Angeles Daily Sentinel. They have an estranged relationship until James is found dead from an allergic reaction to a bee sting. After a funeral, Britt fires the staff aside from his fiancee, but later rehires a mechanic, martial artist and friend of James named Kato as his assistant. Britt and Kato quickly become best friends and get drunk together. Upon agreeing that they both hated James, the two visit the graveyard to cut the head off of James's memorial statue. After they succeed, they rescue a nearby couple being mugged. When police mistake Britt and Kato for criminals, Kato evades them in a car chase as he and Britt return to their mansion. Britt convinces Kato they should become superhero-like crime-fighters posing as criminals. 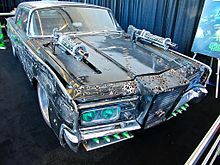 Kato develops a car outfitted with several gadgets and weapons, which they call the Black Beauty. Britt plans to capture Benjamin Chudnofsky, a Russian mobster and gangster uniting the crime families of Los Angeles under his command, and whom his father was trying to expose. To get Chudnofsky's attention, Britt uses the Daily Sentinel as a vehicle to publish articles about a "high-profile criminal" he names "The Green Hornet." Britt hires Lenore Case as his researcher, and uses her unwitting advice to raise the Green Hornet's profile. Britt and Kato blow up several of Chudnofsky's meth labs, leaving calling cards so Chudnofsky can contact them. Throughout all this, the Daily Sentinel's managing editor, Mike Axford, fears this single-minded coverage will endanger Britt's life, and District Attorney Frank Scanlon frets over public perception that he cannot stop the Green Hornet. Britt asks Lenore out for dinner, but she rebuffs him and instead invites Kato, making Britt confused and jealous. Kato learns from her that mobsters often offer a peace summit to rivals in order to get close enough to kill them; Britt then tells Kato that Chudnofsky has offered them such a meeting. Kato tries dissuading him, but Britt, feeling overshadowed, follows his instincts. This nearly proves fatal when Chudnofsky tries to kill them. Barely escaping to the mansion, Britt and Kato start arguing and the two get into a fight, causing Britt to angrily fire both Kato and Lenore, who he believes are in a relationship. Later, Kato receives an email from Chudnofsky on the Hornet's calling-card email address, offering $1 million and half of Los Angeles to the "Hornet" if he kills Britt. Meanwhile, Britt discovers that Scanlon is corrupt and that he tried to bribe James into downplaying the city's crime level to help his career. Chudnofsky, meanwhile, suffers a midlife crisis and renames himself as a supervillain known as "Bloodnofsky". Scanlon invites Britt to a meeting in a restaurant, where he reveals that he was responsible for the murder of Britt's father as he is shown to be an ally of Chudnofsky. Chudnofsky arrives with his henchmen to kill Britt, but Kato appears and saves Britt before they escape. At the Daily Sentinel, Britt intends to upload a recording of Scanlon's confession onto the Web - which he belatedly discovers he did not manage to record. Chudnofsky and his men, who followed the duo there, engage them in a firefight, wounding Britt in the process. However, Kato ultimately impales Chudnofsky in the eyes with two large pieces of wood in self-defense before Britt guns him down. A SWAT team appears and fires at the Green Hornet and Kato, who use the remains of their nearly demolished Black Beauty to run Scanlon out of the building to his death. The Green Hornet and Kato flee to Lenore's house where she learns their true identities and hides from the police before trying to help by removing the bullet from Britt. The next morning, Britt promotes Axford to chief editor and lies about being shot by Kato, further establishing the Green Hornet as a vigilante and allowing Britt to get treated by professionals. Later, Britt and Kato wield James' stolen head back onto his memorial statue. Now with Lenore on their side, the two decide to continue protecting Los Angeles by breaking the law while fighting criminals and saving civilians. Seth Rogen as Britt Reid/Green Hornet: A wealthy newspaper publisher who is secretly the masked crimefighter The Green Hornet. Jay Chou as Kato: A personal mechanic and martial arts expert who becomes the Green Hornet's valet and partner. Cameron Diaz as Lenore Case: The love interest of Reid and Kato. She is also Reid's secretary for The Daily Sentinel. Tom Wilkinson as James Reid: Britt's stern, wealthy father and a successful newspaper publisher. Christoph Waltz as Benjamin Chudnofsky: A paranoid Russian gangster who plans to join all of the crime families of Los Angeles together to organize a "super-mafia." Throughout the film, he worries that he is losing his edge, and eventually starts calling himself "Bloodnofsky" in a misguided attempt to intimidate his enemies. David Harbour as D.A. Frank Scanlon: In this film, Scanlon is an ally of Benjamin Chudnofsky who bribed town officials into downplaying the city's level of crime in order to help his career. Variety reported in October 1992 that The Green Hornet was one of the properties represented by Leisure Concepts Inc., and though the trade paper said, without explanation, "rights in limbo", negotiations were ongoing with Universal Pictures. By September 1993, Chuck Pfarrer had finished the screenplay. Rich Wilkes was hired to rewrite Pfarrer's script, which resulted in George Clooney signing a pay-or-play contract. Clooney dropped out in December 1995 to star in Batman and Robin, and an anonymous source at Universal told Entertainment Weekly the following May that Greg Kinnear was being looked at for the title role. Jason Scott Lee by this time had signed on to co-star as Kato. Universal hired music video director Michel Gondry in January 1997 for his feature film directorial debut. Gondry rewrote the Wilkes screenplay with Edward Neumeier, saying that "after one-and-a-half years, it was shelved by the studio. ... We already had the designs for the cars, the weapons. ... Lawrence Gordon and Lloyd Levin had been signed on to produce by January 1997. Mark Wahlberg was offered the lead role, but the film languished in development hell and Gondry eventually left. In April 2000, Universal entered early negotiations with Jet Li to star as Kato for $5.2 million against 5% of the film's gross. Dark Horse Entertainment and Charles Gordon joined Larry Gordon and Lloyd Levin as producers. Christopher McQuarrie was writing a script by June 2000, but with it uncompleted by October, Li moved on to work on The One while remaining attached to The Green Hornet. After spending about $10 million in development since 1992, Universal put The Green Hornet in turnaround in November 2001, by which time Li and the producers were no longer involved. Paramount and Columbia Pictures showed interest in picking up Universal's option, but Miramax Films won the bidding that month with what Variety reported as "a deal approaching $3 million." In May 2003 the studio was working with automobile companies on product placement opportunities for the Black Beauty. As part of the deal, Miramax would receive its "hero car" and $35 million in additional marketing. The car company that would have landed the deal would be given the chance to help develop The Green Hornet, since a script had yet to be written and no director was attached to the planned 2005 release. Variety noted this figure would have tied the record $35 million deal between Ford Motor Company and MGM that featured the company's Aston Martin Vanquish, Jaguar XKR and Ford Thunderbird in the James Bond film Die Another Day. In February 2004, Miramax president Harvey Weinstein hired cult filmmaker and comic book writer Kevin Smith to write and direct the film, based on their previous four-film collaborations. "I dig the fact that he kicked off a run of billionaire playboys who decided to put on a mask and fight crime and that he was Batman before there was a Batman," Smith said. "I always said I'd never do a superhero film, based on my limited experience writing on Superman Lives and having to answer to the studio, Jon Peters, the comics company and eventually a director. Then there's a fandom that gets up in arms if you even try to stray from their character. Here, there is simplicity in the character and the situation." Jon Gordon and Hannah Minghella were now on as producers, with Harold Berkowitz and George Trendle, son of the character's co-creator, as executive producers. Smith approached Jake Gyllenhaal for the lead role in March 2004. In mid-November of that year, he said he had written about 100 pages, and estimated another 100 to come. In February 2006, Smith's official website noted, "Kevin officially no longer has anything to do with the Fletch or Green Hornet projects." Smith went on to write the Dynamite Entertainment comic book Green Hornet, which has run 11 issues as of late 2010. In March 2007, producer Neal H. Moritz, who had been trying to acquire the film rights to the character for years, obtained the rights and through his Sony-based production company Original Film optioned them to Columbia Pictures. In July 2007 Seth Rogen, in addition to starring in the lead role, was hired to co-write the script with frequent collaborator Evan Goldberg and named as an executive producer for The Green Hornet. Rogen in July 2007 said he had not begun writing the screenplay yet, but anticipated the tone would be that of "a buddy action movie" with humor, "like Lethal Weapon and 48 Hrs.. In September 2008, Columbia Pictures announced a June 25, 2010, release date, and that Hong Kong star Stephen Chow had signed to direct and to co-star as Kato. Chow, a fan of the TV show as a kid, explained, "The idea of stepping into Bruce Lee's shoes as Kato is both humbling and thrilling, and to get the chance to direct the project as my American movie debut is simply a dream come true." Chow dropped out as director the following December over creative differences. On February 24, 2009, Columbia Pictures announced that Michel Gondry would direct the film, on which Chow had remained as Kato, after impressing Columbia production presidents Doug Belgrad and Matt Tolmach with his pitch. 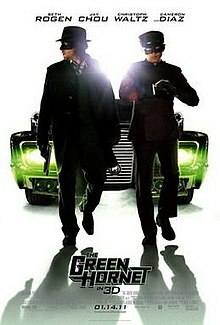 Gondry had previously been involved with The Green Hornet when Universal Pictures was planning its version in 1997. Chow dropped out as Kato in July 2009 over scheduling conflicts with other projects. By this time the release date had been pushed to July 9, 2010. In August, he was replaced with Taiwanese singer-actor Jay Chou. The studio was then in early talks with Nicolas Cage to play the gangster villain, and Cameron Diaz was negotiating to play researcher and love interest Lenore Case. Nicolas Cage had been in talks to play the role of Benjamin Chudnofsky, saying in 2009, "The Green Hornet was something I wanted to do. I think Michel Gondry is very talented and I had hoped it would work. But I think Seth Rogen and Michel had a different direction for the character totally than the way I wanted to go. ... I wasn't interested in just being straight-up bad guy who was killing people willy-nilly. I had to have some humanity and try to give it something where you could understand why the character was the way he was. But there wasn't enough time to develop it." The filmmakers had wanted Van Williams, who played the Green Hornet in the 1960s television series, to make a cameo appearance as a cemetery guard, but Williams turned the part down. Producer Neal H. Moritz considered filming The Green Hornet in Michigan, New York, and Louisiana, but ultimately chose Los Angeles, California, as the primary location shooting. "Ultimately, we made the decision, and thankfully the studio agreed with us, that the creative positives of shooting in Los Angeles outweighed the tax incentives offered to us elsewhere," Moritz said. Principal photography began at Sony Pictures Studios in Culver City, California on September 2, 2009, for one week. Filming then moved to Chinatown, Los Angeles, for scenes featuring Kato's apartment. Through November, other locations included Sun Valley, Holmby Hills (specifically Fleur de Lys, which played the part of the Reid mansion), Bel-Air, Hawthorne and various locations downtown, including City Hall and the Los Angeles Times Building. Sony replaced the film's June 25, 2010, release date with Grown Ups, which moved The Green Hornet to July 9, 2010. Sony then scheduled the film for December 22, 2010, before announcing on April 23, 2010, that it was pushing to January 14, 2011, to secure more time to convert it to 3D. In July 2009, Sony presented a panel at San Diego Comic-Con International, where Seth Rogen and director Michel Gondry unveiled the first look for the Black Beauty. The first trailer was released online on June 24, 2010. The film was released in the U.S. and some foreign markets on January 14, 2011, opening in 3,584 theaters domestically. Producer Neil Moritz said in March 2012 no sequel would be forthcoming since The Green Hornet was made "for too much money. One, we made it in L.A. for certain reasons, and two, we decided to go to 3D—that added another $10 million. If I had done it in a tax-rebate state and not done 3D, it would have been considered a huge financial success for the studio. So we're not making a sequel right now." Factory Entertainment produced six-inch action figures and a die-cast Black Beauty, among other collectibles. Hollywood Collectibles has made a full-size prop gas gun replica. Mezco Toyz has made a set of 12-inch action figures, with the prototypes donated to the Museum of the Moving Image. The studio and CKE Restaurants, Inc., the parent company of Carl's Jr. and Hardee's, formed a promotional marketing partnership that included commercials featuring Seth Rogen and Jay Chou in character as the Green Hornet and Kato; a beverage promotion with Dr. Pepper; The Green Hornet food items, kids' meal toys, and employee uniforms; and a contest with the grand prize of a Black Beauty car from the film. A tie-in video game for iPhone and iPad was released, entitled The Green Hornet: Wheels of Justice. The game is a 3D top-down driving game. It also featured a hidden mini-game fighting game called The Green Hornet: Crime Fighter, which was also released for browsers and Android phones. Green Hornet: High Speed Chase, a roller coaster themed to the 2011 Green Hornet film, opened to the public at the Motiongate Dubai theme park within Dubai Parks and Resorts in Dubai, United Arab Emirates on December 16, 2016. Located within the Columbia Pictures Zone of the theme park, the roller coaster is a custom "Bobsled" model made by the German ride manufacturer, Gerstlauer. The individual coaster cars are themed to resemble the Green Hornet's Black Beauty, and a Black Beauty replica can be found in the ride's queue. The Discovery Channel television show MythBusters aired a "Green Hornet Special" that featured Seth Rogen joining the hosts in testing two "myths" from the movie. The cable network Syfy aired a marathon of the TV series The Green Hornet on January 11, 2011, as a tie-in to the film's release. The Green Hornet was released on DVD, Blu-ray and Blu-ray 3D on May 3, 2011 by Sony Pictures Home Entertainment. On the aggregation website Rotten Tomatoes, the film has an approval rating of 43% based on 228 reviews, with an average rating of 5.2/10. The site's critical consensus reads, "It's sporadically entertaining, but The Green Hornet never approaches the surreal heights suggested by a Michel Gondry/Seth Rogen collaboration." The aggregator Metacritic gave the film a score of 39 out of 100, based on 39 critics, indicating "generally unfavorable reviews". Kenneth Turan of the Los Angeles Times called it "[a]n anemic, 97-pound weakling of the action comedy persuasion ... a boring bromedy that features a hero who has no idea what he's even doing with mumblecore heroics instead of the real thing." Lou Lumenick of the New York Post found it "an overblown, interminable and unfunny update (in badly added 3-D)", and called star Rogen "miscast". British critic Peter Bradshaw of the British newspaper The Guardian, said, "Almost everything about the film is disappointing. Christoph Waltz is under-par as the villain with nothing like the steely charisma of his Nazi in Inglourious Basterds. Richard Roeper gave the film a D+, calling it "a lazy, sloppy, unfunny comedy that makes almost no use of the 3-D technology", and judging that "it just falls flat." Roger Ebert gave it one star and called it "an almost unendurable demonstration of a movie with nothing to be about. Although it follows the rough storyline of previous versions of the title, it neglects the construction of a plot engine to pull us through." He also noted the poor use of 3-D and suggested it was added solely in order to charge extra. Elizabeth Weitzman of the New York Daily News gave it 3​1⁄2 stars out of 5, and commented that the "irreverently funny" film had "a vibe so casual you half expect star Seth Rogen to amble off screen and put his feet up on the seat next to you," and praising director Gondry's "sense of humor and acute visual skill" even while calling the movie "cheerfully unfocused". Rogen proclaimed the film was a "nightmare", chalking it up to studio executives paying little attention to the most expensive portions of the film and its inflated budget. Paste ranked The Green Hornet as the 88th greatest superhero movie of all time. The Green Hornet took in $33,526,876 its opening weekend, and just over $40 million for the four-day Martin Luther King, Jr. Day holiday weekend, topping the box office. In its second weekend, it dropped 47% to $17.7 million, finishing second to No Strings Attached. In its third weekend, it earned $11.2 million and finished in fourth place. The film ended its theatrical run on April 21, 2011, with a North American domestic gross of $98,780,042 and an international gross of $129,037,206 for a total $227,817,248 worldwide. In 2016, Paramount Pictures and Chernin Entertainment acquired the film rights to the Green Hornet, with developments for a rebooted adaptation. Gavin O'Connor signed on to produce and direct, while Sean O'Keefe will be the screenwriter. ^ "The Green Hornet". British Board of Film Classification. ^ a b c d "The Green Hornet (2011)". Box Office Mojo. Retrieved June 19, 2011. ^ a b Marc Graser (2009-09-14). "Christoph Waltz joins 'Green Hornet'". Variety. Retrieved 2010-10-28. ^ Broeski, Pat H. (1992-10-18). "From the Comics to a Screen Near You". The New York Times. Retrieved 2009-08-31. ^ Fleming, Michael (1993-09-02). "Woo Abuse". Variety. Retrieved 2009-08-29. ^ a b Staff (1996-05-03). "Hornet's Best". Entertainment Weekly. Retrieved 2009-08-31. ^ a b c Cox, Dan (1997-01-29). "'Hornet' Flies with Gondry". Variety. Archived from the original on 2010-12-31. Retrieved 2009-08-29. CS1 maint: BOT: original-url status unknown (link). .
^ a b Hebron, Sandra (2007-02-07). "Michel Gondry". The Guardian. Retrieved 2009-09-04. . WebCitation archive. ^ Susman, Gary (2004-03-18). "Miller Time". Entertainment Weekly. Retrieved 2009-08-31. ^ Murray, Rebecca (2004-10-14). "Kevin Smith on "The Green Hornet" Script, "Star Wars", and Other Projects". About.com. Retrieved 2009-08-30. ^ Cryer, Jay (2006-02-17). "Wondercon: What We Learned!". News Askew. Retrieved 2009-09-05. ^ Bernardin, Marc (2009-05-13). "EW Exclusive: Kevin Smith takes on Batman and the Green Hornet". Entertainment Weekly. Retrieved 2009-08-31. ^ "GCD :: Series :: Green Hornet". www.comics.org. ^ McNary, Dave & Diane Garrett (2007-03-20). "Columbia flies with 'Green Hornet'". Variety. Retrieved 2009-08-29. ^ Garrett, Diane (2007-07-19). "Columbia flies with 'Green Hornet'". Variety. Retrieved 2009-08-29. ^ Murray, Rebecca (2007-07-29). "Exclusive Interview with the Cast of Superbad". About.com. Retrieved 2010-10-27. ^ Fleming, Michael (2008-12-18). "Chow No Longer to Direct ''Hornet''". Variety.com. Retrieved 2010-12-25. . WebCitation archive. ^ "Michel Gondry to Direct 'The Green Hornet'". Columbia Pictures press release. February 24, 2009. Archived from the original on December 31, 2010. Retrieved 2010-12-25. .
^ a b c McNary, Dave (2009-08-07). "'Green Hornet' casts Kato role". Variety. Archived from the original on 2011-01-15. Retrieved 2009-08-29. CS1 maint: BOT: original-url status unknown (link). .
^ Slotek, Jim & Kevin Williamson (October 11, 2009). "Cage anti hero". Toronto Sun. Archived from the original on January 15, 2011. Retrieved January 15, 2011. CS1 maint: BOT: original-url status unknown (link). .
^ "Van Williams, TV's Green Hornet, Dies at 82". The Hollywood Reporter. ^ Marshall, Rick. "Michel Gondry Talks 'Green Hornet' Legacy, No Cameo For Van Williams", MTV News, March 22, 2010. WebCitation archive. ^ a b Verrier, Richard (2009-09-09). "'The Green Hornet' does battle in LA". Los Angeles Times. Archived from the original on 2011-01-01. Retrieved 2009-09-10. CS1 maint: BOT: original-url status unknown (link). ^ Huffman, John Pearley (2010-05-14). "Twenty-Nine Imperials as Black Beauty in One 'Green Hornet'". The New York Times. Archived from the original on May 28, 2010. Retrieved 2010-12-03. ^ "Lot #645.1 1965 CHRYSLER IMPERIAL CUSTOM SEDAN "BLACK BEAUTY"". barrett-jackson.com. Barrett-Jackson Auction Company LLC. Retrieved 30 June 2017. ^ McClintock, Pamela (2009-07-01). "Sony shuffles 2010 comedies". Variety. Retrieved 2009-08-29. ^ Vary, Adam B. (2009-07-23). "Comic-Con video: Seth Rogen talks 'The Green Hornet'". Entertainment Weekly. Retrieved 2009-08-31. ^ "'21 Jump Street' Producer Neal H. Moritz Talks Tips for Surviving on Set". The Hollywood Reporter. March 9, 2012. Archived from the original on July 19, 2012. Retrieved July 18, 2012. ^ "The Green Hornet by Sony Pictures", iTunes Preview, Apple.com, n.d.
^ "The Green Hornet - Sony Pictures". www.sonypictures.com. ^ a b c "Green Hornet: High Speed Chase - Motiongate (Dubai, Dubai, United Arab Emirates)". rcdb.com. ^ Patrick Hester (2011-01-10). "The Green Hornet Marathon Comes to SyFy". SFSignal. Retrieved 2011-01-13. ^ a b The Green Hornet DVD and Blu-Ray Release Date – Latest DVD Release Dates, Movie Cynics, March 14, 2011, Accessed May 28, 2011. ^ a b The Green Hornet' DVD & Blu-Ray Release Date And Specs, MTV Splash Page, March 13, 2011, Accessed May 28, 2011. ^ a b 'The Green Hornet' DVD, About.com, Accessed May 28, 2011. ^ Bradshaw, Peter. "'The Green Hornet' – Review"', The Guardian, January 13, 2011. ^ "The Green Hornet". Chicago Sun-Times. 2011-01-12. ^ "The 100 Best Superhero Movies of All Time". pastemagazine.com. ^ Fleming, Mike, Jr. (November 15, 2016). "Badass 'Green Hornet'? Paramount, Chernin Set Gavin O'Connor For Movie". Deadline.com. Archived from the original on December 9, 2016. Retrieved December 10, 2016.